Cooking has always been a passion of mine but since the start of this year, I hardly had the time to choose recipes to try, to shop and to actually cook. After watching Julie and Julia over the weekend, I was inspired again to bond with my kitchen. It has remained spotless for a couple of months now and how I miss filling up our home with the smell of butter, leaving tiny oil drops our stove and watching both Paul and my family enjoy my little kitchen experiments. Back then, it would take me hours to be able to cook just one dish, preparation time would take forever, even longer than the actual cooking time. I'm so glad that the team behind Yummy Magazine came out with another book. Browsing through all 75 recipes, I have already tagged a couple of them that I will definitely try this coming weekend. 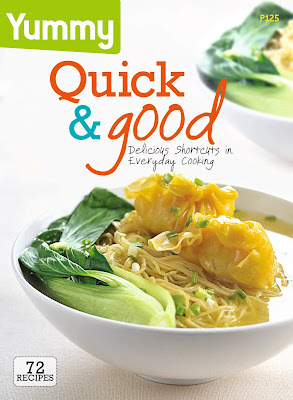 It has easy recipes using canned products such as the Corned Beef Linguine, the Tempura Meat Loaf (a.k.a. SPAM) and the Chili con Carne. I am also excited to try the different dips, sauces and marinades which is perfect as my family is planning a steak dinner soon! Check it out, this handy book is available in all newsstands and supermarkets for only P125! Quoting both Julie and Julia.... Bon Apetit!